For the final installment of my What To Wear (Wedding Edition) series, I've put together a number of outfits designed to suit a beach wedding. One of the distinct features of a beach wedding is that it is completely outdoors. Surrounded by incredible views of the water, soft sand, and salty air, beach weddings can be some of the most beautiful, relaxed, and effortlessly chic ways to tie the knot. However, just because the venue is on the beach, doesn't mean it's necessarily appropriate to wear a swimsuit and cover-up to the wedding! Given that the venue is in a more natural setting, you'll want to keep things casual, while still retaining the proper tone of such a momentous occasion as a wedding. Dresses and accessories featured in this post are available online from ModCloth. 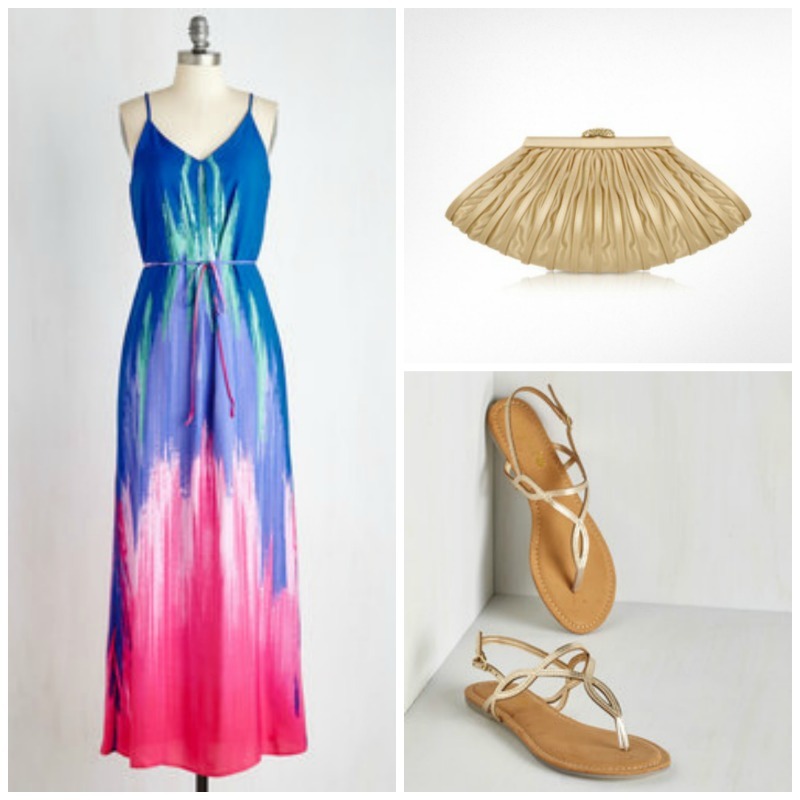 First up, I've selected a beautiful watercolor maxi dress, paired with gold sandals, and a gold clutch in a shell-like shape. The colors of the dress reflect the blue/green hues of the ocean, while the pink adds a bright pop of color that is reminiscent of a sunset. With such a beautiful and bold dress, accessories in neutral metallic shades (like gold) compliment the look best. 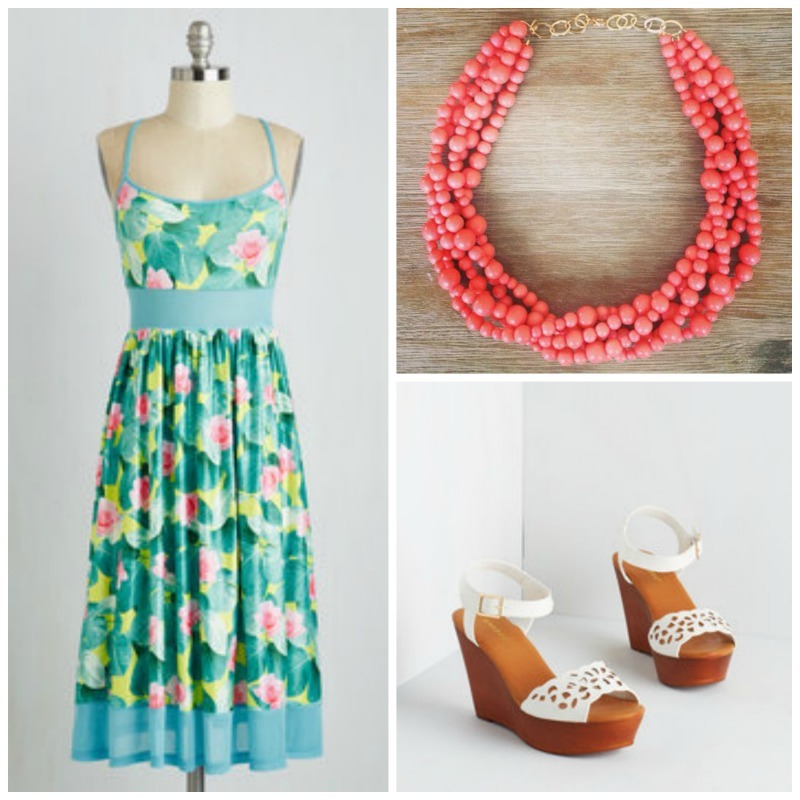 Secondly, I've selected an empire-waist floral dress, paired with white wedge sandals, and a bright pink coral necklace. The floral pattern of the dress is reminiscent of a tropical garden, while the pink of the flowers is complimented by the pink of the coral necklace. The laser-cut white wedge sandals are fresh and modern, while adding a glamorous flare to the outfit. 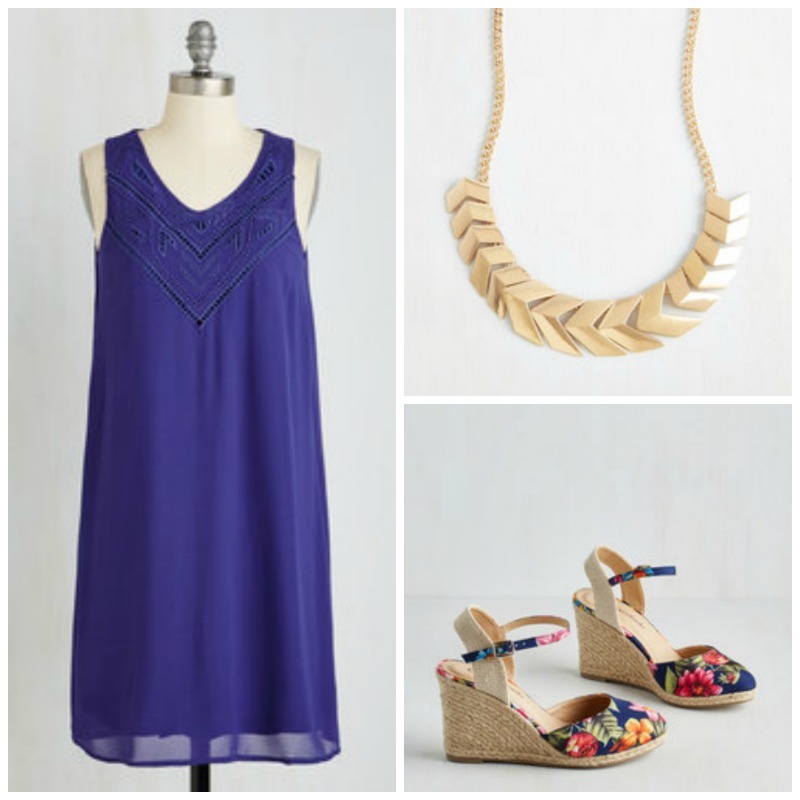 Third, I've gone with a simple indigo blue linen sheath dress, paired with a gold leaf necklace, and floral print espadrilles. The dress itself is a simple design in a beautiful rich color reminiscent of the sea. The floral print on the wedge espadrilles is an exotic, tropical print that compliments the dress, while the gold necklace adds an element of sophistication and class. 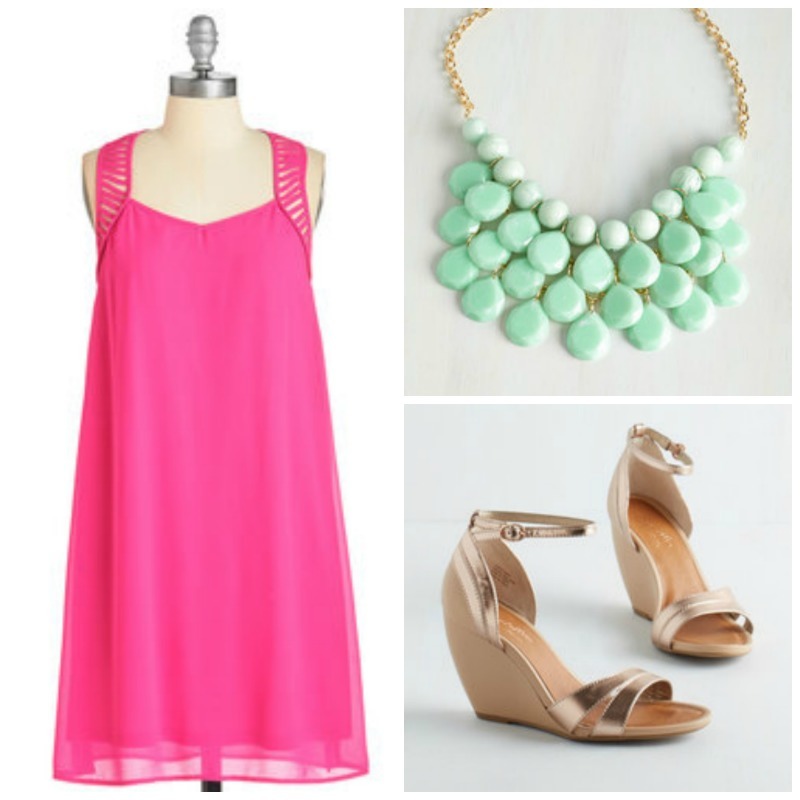 Next up, I've selected a bright pink chiffon sheath dress, paired with rose-gold wedge sandals, and a mint statement necklace. The light, airy design of the dress is perfect for a beach wedding, while the rose-gold wedges and the mint statement necklace work together to complete the look. Next up, I've selected a beautiful jade halter dress, paired with floral print wedges, and gold shell earrings. 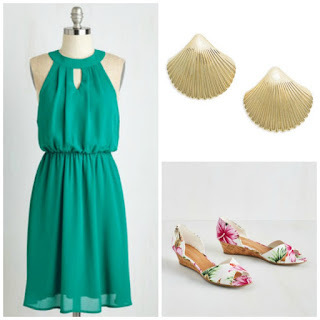 The rich color of the dress is reminiscent of the sea, while the gold shell earrings and tropical floral print wedges provide stunning accents to the look. 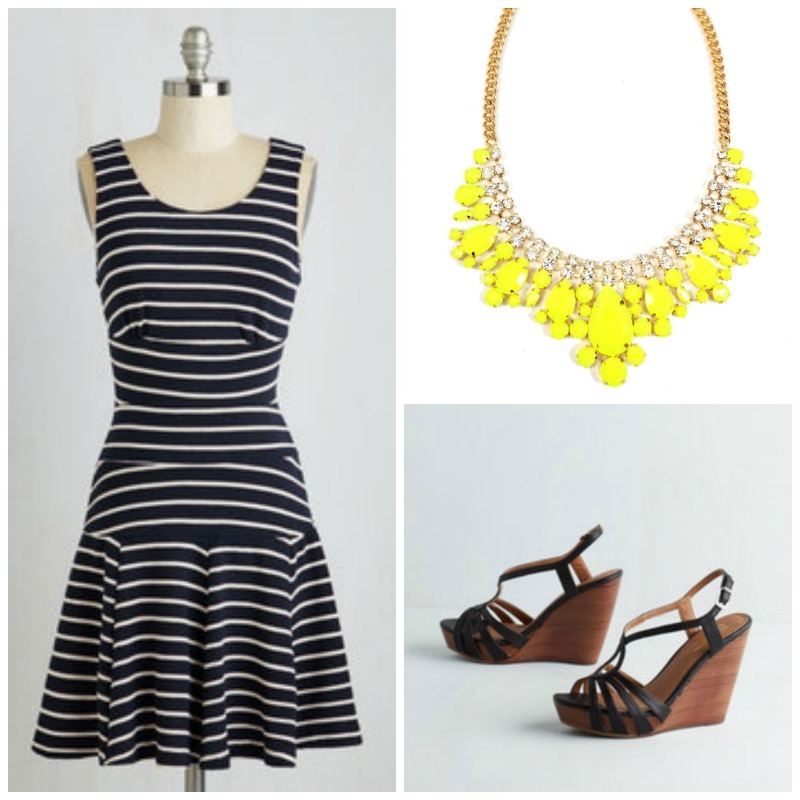 Finally, I've gone for a slight twist on a classic nautical look, with a navy and white striped dress, black wedge heels, and a bright yellow statement necklace. The specific design of the stripes on the dress create a natural hourglass shape, while the black wedge sandals add glamour to the look. The bright yellow statement necklace provides a fun pop of color that perfectly compliments the effortless nature of a beach wedding.